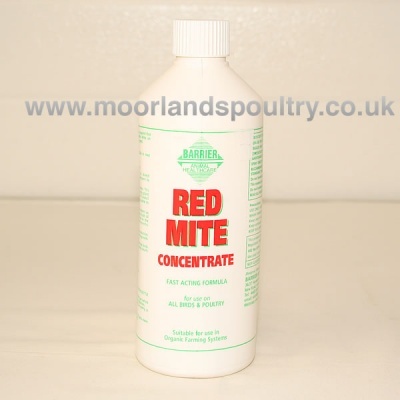 Barrier Red Mite Concentrate is an effective repellent against the scourge of poultry keeping - red mite. Containing the same active components as the Barrier Red Mite Powder, this liquid concentrate should be diluted to between 1:50 and 1:20 and applied into all the nooks and crannies of your chicken coops using a spray knapsack. Using only 100% natural, non-irritant ingredients Barrier Red Mite products are safe for your birds, for you and for the environment.